The Venus Express spacecraft has completed its 3,000 th orbit of the tempestuous planet, dived into the atmosphere, is on its way back out, and is somehow still transmitting. Not bad for a probe designed to last a measly 500 orbits! 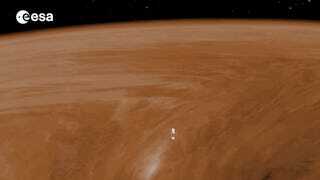 The European Space Agency's Venus Express has been reporting from Venus for the past eight years. It completed all its science objectives on May 15 th, and celebrated its 3,000th orbit around the inner planet on July 7th. With nothing left to lose and fuel reserves running low, the probe started skipping through the atmosphere for one last experiment: aerobraking. Normally, the probe dances along an elliptical orbit soaring over the south pole 66,000 kilometers over the surface, sweeping down to 250 kilometers altitude over the north pole once every 24 hours. For the last week, it's been swooping lower and lower on closest approach, getting closer to the surface than any other probe in decades. What's particularly fascinating about aerobraking is that dropping the velocity at pericentre (the point closest to the planet) draws the apocentre (the point farthest from the planet) in closer. Over time, this can transition a craft's orbit from being highly elliptical to circular. This is a trick of orbital dynamics used by NASA's Mars Reconnaissance Orbiter slip into a circular orbit, and it's the same trick that ESA's ExoMars orbiter will use in the future. Venus Express has a highly elliptical orbit and will only be aerobraking for a few weeks, with no where near as much aerobraking as it'd take to make it circular. The aerobraking experiment executed 15 manoeuvres to drop the probe to a bare 130 kilometers at closest approach. Each aerobraking pass, the atmospheric density increases the dynamic pressure encountered by the spacecraft, slowing it down. By now, the velocity at pericentre had dropped 10 meters per second, and the orbital period had decreased by over an hour! It's going to keep getting slower for the next few weeks as it climbs back out of the atmosphere to higher altitudes, each orbit dragging a little more. Velocity decrease with respect to the orbit number. The jump at pericentre number 2986 marks a day the altitude was dropped. Credit & read more at the ESA Rocket Science blog. The science team is tracking the drag to build a profile of atmospheric density. Not only is the density varying with altitude, but it's also varying day to day, and it's varying between day and night. The graph above tracks how the velocity changes each orbit, always measured at the pericentre. The daily variation is intense, possibly driven by atmospheric waves, solar activity, or something yet to be determined. The big jump on pericentre 2986 marks a day spacecraft swooped lower. Lower in the atmosphere, the daily variation got even more extreme. The atmospheric density changes sound minimal — climbing from 10 -11 kg/m3 to 10-8kg/m3 — but that works out to a thousandfold increase in atmospheric density when dropping from 165 to 130 kilometres above the planet's surface. That change is enough to crank the stress on the probe. Even more crazy is that just 100 seconds of braking through the atmosphere is enough to produce frictional heating severe enough to scorch the solar panel with temperatures climbing by 100°C! Any hotter and probe would be at serious risk. Amazingly, Venus Express survived all of this. Now, its orbit is going to start climbing back out, raising the closest approach to 450 kilometres altitude by July 26th. Assuming it makes it and doesn't run out of fuel along the way, it can finally rest. Once boosted to a nice, healthy distance, it will be left to admire the view, gently decaying until meeting Venus up close and personal in December of this year. And if it does run out of fuel? The plan is the same, it will just come crashing down a little sooner. Top image credit: ESA/C. Carreau.